People have long speculated about the fate of the Ark of the Covenant the Bible says the Israelites carried during their Exodus from Egypt. Although of no help on that question, a well-preserved Egyptian temple may provide clues about the origins of that famous box. The Temple of Edfu was built by the Greek rulers of Egypt beginning in the third century B.C. to honor Horus, the falcon god of the sky. Following the model of much earlier temples, a small statue of Horus resided in a niche in the temple’s Holy of Holies, accessible only by the pharaoh and the high priest. Priests occasionally transported the god statue away from the temple in an ark (box) resting in a miniature boat carried on two poles. 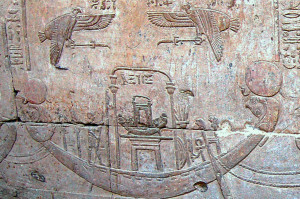 A replica of the ark now displayed in the Holy of Holies is based on a wall relief showing the ark with its poles sitting on a pedestal in a boat floating on the Nile. Two bird-like creatures face each other above the ark, their wings extending over the seat on which Horus sat. 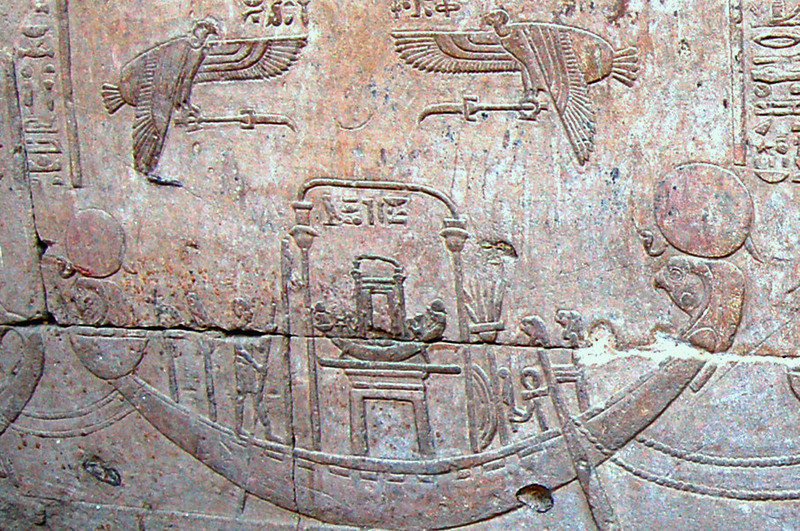 So what does Edfu’s ark of Horus have to do with the Ark of the Covenant? According to the Bible, the Ark of the Covenant, enthroning the invisible Jewish God, was carried on two poles attached by rings to the base. The Ark incorporated two “cherubim” facing each other, their wings extending over the “mercy seat” from which God spoke. When the Israelites built their Temple in Jerusalem, they ensconced the Ark in its Holy of Holies, which the Jewish High Priest entered once each year. Jewish soldiers carried God in the Ark as they went to battle the Philistines. The Temple of Edfu was built following the Exodus. So the ark of Horus might have drawn on descriptions of the Ark of the Covenant. The striking resemblances could be coincidental. However, temples erected before the Exodus contain similar, less-well-preserved, images of arks transporting Egyptian gods. It seems likely that the Israelites, as they left Egypt, carried their invisible God in an ark similar to the ones with which they were familiar.